Electric water heater thermostats turn power to heating elements on and off. The thermostat is a switch that operates automatically according to the temperature of the tank water. The very back of the thermostat is a bi-metal disk, pressed tightly to the side of the tank. Bi-metals consist of two different metals that expand and contract at different rates according to temperature. This causes the metal to flex suddenly. Used in conjunction with a switch, bi-metal strips and disks are useful for controlling temperature. The clicking you hear on some devices, such as coffee makers and electric water heaters, as they cycle the heat on and off is the bi-metal disk or strip flexing back and forth which operates the switch. Electric water heaters use heating elements to heat the water. Some elements are 240 volt elements, others are 120 volt. Small-capacity electric water heaters may only have one element, suitable for households with one or two people. 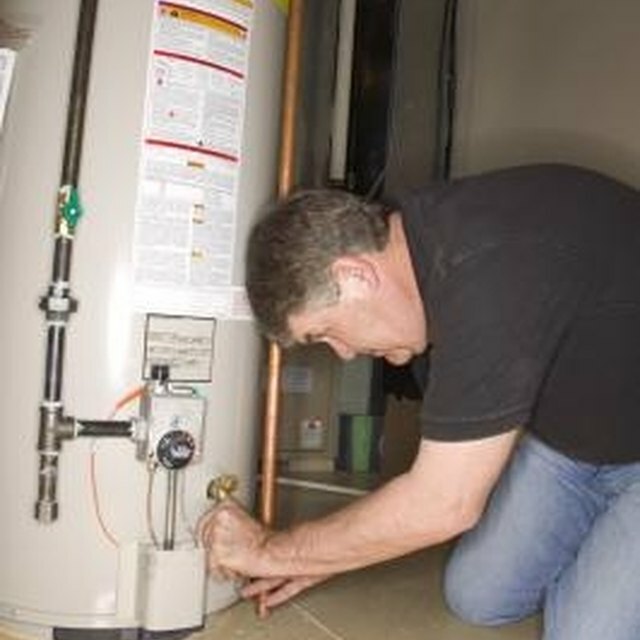 Larger capacity water heaters have two elements and two thermostats. Electric water heater thermostats turn power to heating elements on and off. The thermostat is a switch that operates automatically according to the temperature of the tank water The very back of the thermostat is a bi-metal disk, pressed tightly to the side of the tank. Bi-metals consist of two different metals that expand and contract at different rates according to temperature. This causes the metal to flex suddenly. Used in conjunction with a switch, bi-metal strips and disks are useful for controlling temperature. The clicking you hear on some devices, such as coffee makers and electric water heaters, as they cycle the heat on and off is the bi-metal disk or strip flexing back and forth which operates the switch Electric water heaters use heating elements to heat the water. Some elements are 240 volt elements, others are 120 volt. Small-capacity electric water heaters may only have one element, suitable for households with one or two people. Larger capacity water heaters have two elements and two thermostats. Single-element electric water heaters are the simplest. They have one heating element and one thermostat. A control adjustment on the thermostat allows the desired water temperature to be set When the temperature of the water cools below the setting, the thermostat turns on power to the element, which heats the water until the temperature rises to the control setting. The power to the element is turned off, and the cycle is ready to start again. Dual-element electric water heaters have two thermostats, one for the top element and one for the bottom element. The top thermostat controls both the upper element and the lower thermostat. The two elements do not operate at the same time Water heaters are filled from the bottom. A fill tube goes from the intake at the top of the tank to the bottom of the tank, so that cold water enters at the bottom, leaving hot water at the top, where it exits the tank at the outlet as needed The upper element is the primary element. It operates first to heat water at the top of the tank and make it available for use. Starting with a tank of cold water, the primary thermostat at the top turns on the upper element and keeps it on until the water temperature reaches the setting on the thermostat The primary thermostat turns off the upper element and sends power to the lower, secondary thermostat which turns on the lower element. The lower element heats the water at the bottom of the tank until it reaches the control setting temperature. All the water in the tank is now hot and both elements are off Water is used from the top of the tank, which brings cold water into the bottom of the tank and pushes hot water at the bottom towards the top. Since the upper thermostat is still off, the lower thermostat turns on the lower element again to heat the additional cold water until it reaches the temperature setting If enough hot water is used so that the tank is once again filled with cool water, the upper thermostat will turn on the upper element and turn off the lower thermostat, starting the process over again.